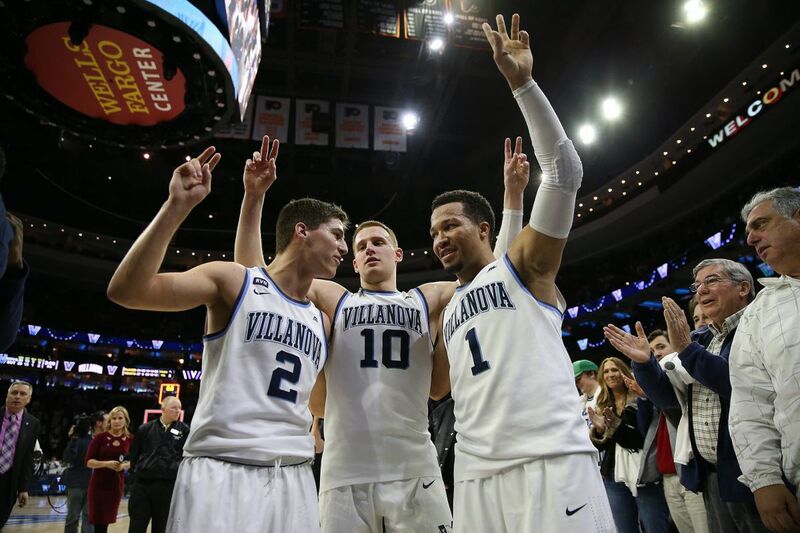 Villanova’s Collin Gillespie, left, Donte DiVincenzo, center, and Jalen Brunson, right, salute the students section after their victory over Butler. Villanova wins 86-75 over Butler at the Wells Fargo Center in Philadelphia on February 10, 2018. Defending champion: Villanova defeated Creighton, 74-60, in the final. Game 1: (8) Georgetown (15-14, 5-13 in Big East) vs. (9) St. John's (15-16, 4-14), 7 p.m.
Game 2: (7) Marquette (18-12, 9-9) vs. (10) DePaul (11-19, 4-14), 9:30 p.m.
Game 3: Georgetown/St. John's winner vs. (1) Xavier (27-4, 15-3), noon. Game 4: (4) Creighton (21-10, 10-8) vs. (5) Providence (19-12, 10-8), 2:30 p.m.
Game 5: Marquette/DePaul winner vs. (2) Villanova (27-4, 14-4), 7 p.m.
Game 6: (3) Seton Hall (21-10, 10-8) vs. (6) Butler (19-12, 9-9), 9:30 p.m.
Game 7: Winner of Game 3 vs. Winner of Game 4, 6:30 p.m.
Game 8: Winner of Game 5 vs. winner of Game 6, 9 p.m.
Jalen Brunson, Villanova, G, Jr., 19.0 ppg., 4.8 apg. Trevon Bluiett, Xavier, G, Sr., 19.4 ppg. Kelen Martin, Butler, F, Sr., 21.2 ppg., 6.4 rpg. Marcus Foster, Creighton, G, Sr., 20.3 ppg. Shamorie Ponds, St. John's, G, So., 21.6 ppg., 2.5 spg. Mikal Bridges, Villanova, F, Jr., 17.6 ppg. Desi Rodriguez, Seton Hall, F, Sr., 18.1 ppg. Jessie Govan, Georgetown, C, Jr., 17.5 ppg., 10.0 rpg. Kyron Cartwright, Providence, G., Sr., 11.4 ppg., 5.8 apg. Markus Howard, Marquette, G, So., 20.9 ppg. Xavier broke Villanova's streak of four consecutive regular-season Big East championships. … The Wildcats average 87.2 ppg, tops in NCAA Division I, and are fourth in made three-pointers with 11.3 per game. … Bluiett is the 13th player in Big East history to be named a first-team all-conference selection three straight years. … Marquette's three-point triple threat of Howard, Andrew Rowsey and Sam Hauser have combined to average 9.68 treys per game. Hauser is third in the nation in three-point shooting at 51.7 percent. … The Golden Eagles rank in the top four in free-throw percentage (79.4 percent, third) and three-point accuracy (41.6, fourth). … Seton Hall's Angel Delgado averaged 11.6 rebounds and led the conference in that department for the second straight season. … St. John's is the league's most adept team at turning opponents over – a plus-4.6 turnover margin (fifth in the nation), 8.7 steals (ninth), and 16.6 turnovers (11th). … Ponds led the conference in scoring and steals. … Creighton ranks in the top 10 nationally in points (84.8 per game, eighth) and field-goal percentage (49.9, 10th).